Detailed Descriptions for American Style Bronze Level Waltz, Foxtrot, Tango, and V. Waltz. 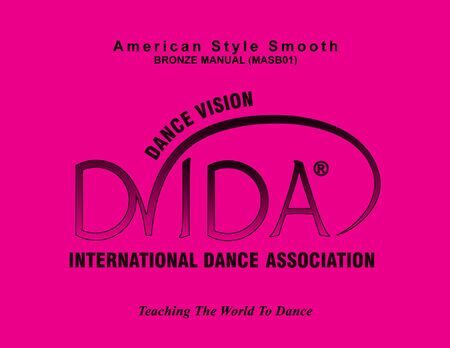 DVIDA manuals are accepted by the NDCA (National Dance Council of America). DVIDA manuals are used for ProDVIDA certification exams and Student DVIDA medal exams. A Dance Position Column: This column indicates the relationship between the partners on every step. Sometimes the information will be a specific dance position (defined in the “Dance Position Chart” under “How to Study the Charts”). Other times a transitional position is given showing that the partners are in the middle of an underarm turn, or preparing to go into an outside position. Incorporating this perspective into your teaching is a very powerful tool for understanding ballroom dancing. Summary Column: This column allows for quick recall of steps and is also an excellent way to teach and understand dance figures. By grouping steps together either by measures or similarities, you will be able to train your students to understand how to learn figures easily. Precedes and Follows: The smooth dances require that you understand alignments, which allows to you to choreograph properly. Based on these alignments, you will find a “Precedes and Follows” list under the tab for each dance with all the possibilities to create beautiful and correct choreography. New Routines: Choreographed to include all the figures in each dance and to flow beautifully around the room. New figures and improvements on the old ones: After working with the syllabus over the years, we have refined some of the figures making them more appropriate for the Bronze level, and have changed alignments and amounts of turn to make them dance more comfortably. We’ve also created some fun and useful new figures. Musical Information: A glossary of musical terms, musical information chart, and examples of how to count in beats and bars. How to Study the Charts: Full explanation of each element with examples of why and how they are used. Also, a complete “Abbreviation Chart” to help you read the charts with ease. Dance Fact Sheets: This is a concise and useful page covering the history, style, musical information, footwork and technical tips for each dance. Glossary: Definitions of over 130 terms used in dancing and teaching. Certification: Helpful information for both student medal tests and professional examinations.